Symphony No. 3 in A Minor, Op. 56, MWV N 18, "Scottish"
Félix - Music or school?
. . . [a] compilation of highlights . . . high-octane passages. The sheer gusto with which they attack the "Danse Russe" from "The Nutcracker" is exhilarating . . . the Gothenburg Symphony's scherzo from Bruckner's 9th demonstrates how ably Dudamel transfers energy . . .
En fait de "découvertes" . . . le "Bacchanale" de "Samson et Dalila" de Saint-Saëns avec Berlin, très enlevée et musclée, sentimentale aussi dans la section centrale . . . The track with the Vienna Philharmonic Orchestra (Vivace non troppo from Mendelssohn’s Symphony No.3) is taken from the brand new charity LP. To understand how Gustavo Dudamel, an ordinary Venezuelan child from a rough neighbourhood, has risen from daydreamer to stardom, it is necessary to understand “El Sistema”. Dudamel grew up with music. His father played the trombone, and he was soon offered violin lessons at the local núcleo. Venezuela’s National System of Youth and Children’s Orchestras offers music lessons to hundreds of thousands of youngsters, many of them from severely disadvantaged backgrounds, through their local núcleos. In return, the children agree to play in an ensemble. As soon as they have mastered the basics of their instrument, they in turn teach and guide younger musicians. It’s all the work of one visionary man. José Antonio Abreu, pianist and economist, founded El Sistema in 1975, when he assembled a small group of young musicians in a parking garage. The group grew from day to day. Today, Venezuela boasts several hundred symphony orchestras. El Sistema is internationally recognised as the benchmark in music education as a force for social change, and has inspired similar organisations in the USA, UK, Germany, Italy, Sweden and throughout South America. It was Abreu who spotted Dudamel’s exceptional talent when he saw the then 15-year-old conducting the Amadeus Chamber Orchestra. Just five years later, Abreu appointed the young man music director of the Simón Bolívar Youth Orchestra, El Sistema’s flagship ensemble. At 25, Dudamel caused an international sensation when he won the inaugural Bamberger Symphoniker Gustav Mahler Conducting Competition. Two years later, Dudamel became chief conductor of the Gothenburg Symphony Orchestra. By the time he was appointed music director of the Los Angeles Philharmonic Orchestra in 2009, he was already a firm favourite with the venerable Philharmonics of Berlin and Vienna. His repertoire spans the high-octane pulse of South American music to the broad emotional sweep of the French, German, Austrian and Russian Romantics – from Beethoven and Tchaikovsky to Mahler and Stravinsky. 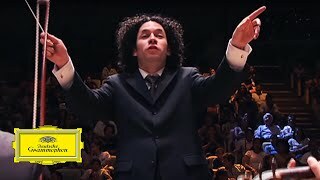 Fuelled by his El Sistema-inspired belief in the transformative power of music, Dudamel embraces a range of media to share his passion for making classical music exciting and accessible to new audiences: his work can be heard on CD, LP and iTunes, and seen via DVD, TV, eVideo, web stream, and on cinecasts around the world. Since 2005, Gustavo Dudamel has been an exclusive Deutsche Grammophon recording artist.